Andy Evansen (left) chats with art enthusiasts at the reception. Photo courtesy of Sharon Mollerus. “A Thousand Words” showcases 47 photographs of humans in a flutter of dynamic situations, intended to inspire imagination and tell a story. Four photographers are native to Duluth and four painters are native to Minnesota. Ivy Vainio, a UMD alumni who graduated with a history major and American Indian Studies minor in 1992, now has her art in the Tweed. Ivy Vainio next to her “Trina Fasthorse” photograph. Photo courtesy of Sharon Mollerus. Her photograph titled “Trina Fasthorse” displays a tribal member of the Mille Lacs band of Ojibwe, who was chosen to represent the tribe as royalty, as she dances at a powwow. A cultural and spiritual activity, each step in the dance is a prayer and is frequent among tribes in America and Canada. 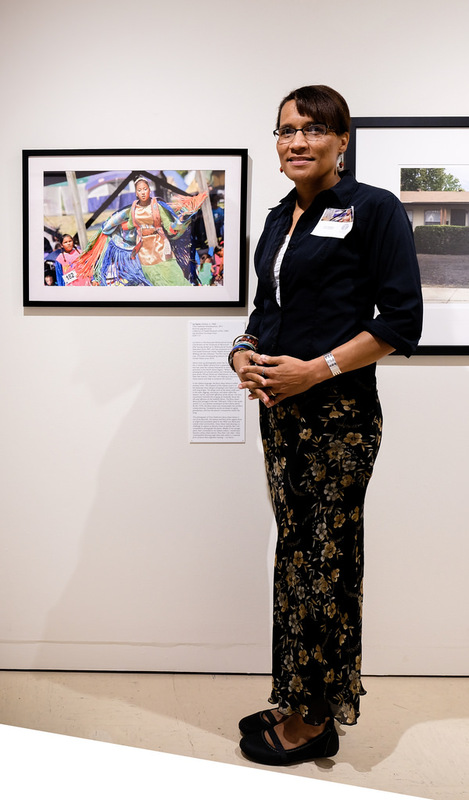 Photography instructor Wanda Pearcy loves the storytelling aspect and the problem solving that’s involved in telling that story. Her photograph in the exhibit has themes of looking at the past, space, feeling lost and history visually packed into it. Pearcy goes about shooting these themes in a unique way. While shooting she wanted to “just be by myself, use the information on the site, and access what's on my psyche to photograph where I feel.” To aid this she brought no props to the site and wore no clothes. “My goal was to find a way to bridge the gap between the external world of assigned norms and my internal world of ethereal space,” Pearcy said. Along with “A Thousand Words,” “Plein Air, America's Industrial Landscape” is being showcased right now at the Tweed. All the paintings on display have the theme of industrial America. Andy Evansen, PAPA’s president and plein air artist, said when the theme was first presented, “some artists were having trouble with the theme of Industrial.” But then it was pointed out that industrial is all around us and can simply be people working. Evansen’s industrial painting displays the chaos of replacing a bridge over the Mississippi river. Jeffrey T. Larson, a guest painter for PAPA and teacher at Great Lakes Academy, spent the whole summer in Duluth painting a grain elevator. Two to three times a week on sunny mornings, Jefferey would come to his location from 9:30 to 11:30 a.m. The plaque adjoining Jeffrey T. Larson’s painting reads, "There is a rugged, majestic and honest beauty to these elevators, piers and warehouses." Photo courtesy of Sharon Mollerus. 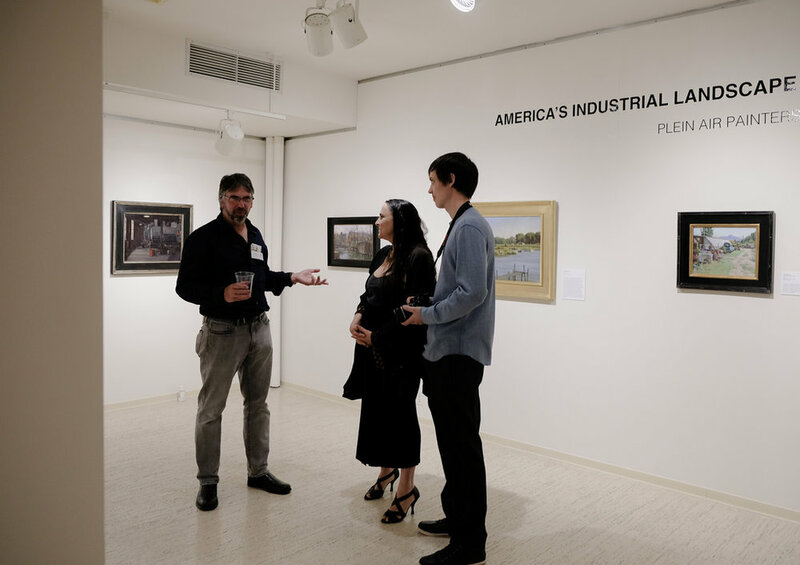 Tweed will feature “Plein Air, America’s industrial Landscape” through November 12 and “A Thousand Words” through December 31.